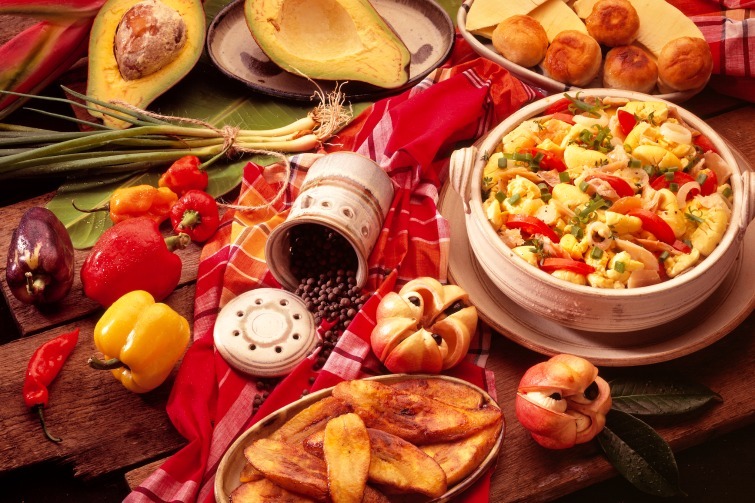 Discover The National Dishes Of The Caribbean - Caribbean & Co. 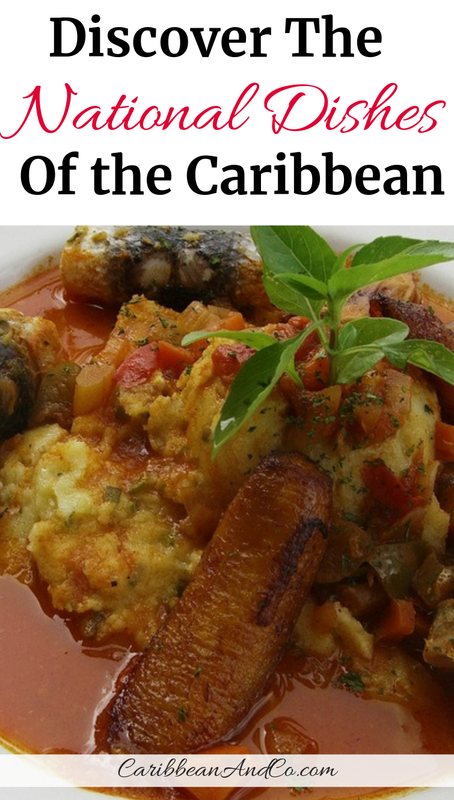 The national dishes of the Caribbean are a great introduction to the cuisine of each country. Some of these Caribbean national dishes are everyday staple foods and some are eaten only on special occasions. Some Caribbean national dishes have been around for hundreds of years, and others are new recipes. Whether old or new, Caribbean food is not only colorful but filled with flavors that engage all of your senses. The national dish of Antigua & Barbuda is fungee and pepperpot. Fungee is the local name for cornmeal which is prepared as a breakfast meal or main entrée. Fungee is cornmeal with okra, cooked in salted water and boiled to a paste. Pepperpot is a combination of a variety of meats, especially salted beef, and pigtail, and includes crushed vegetables such as spinach, eggplant, okra, onions, spices & seasonings, boiled to a soupy finish. The national dish of Anguilla is pigeon peas and rice. Pigeon peas are fresh peas often soaked overnight or tinned peas ready to use. Sometimes referred to as beans, they are combined with rice flavored with spices and served with a meat dish. The national dish of Aruba is Keshi Yena. Believed to have originated with Dutch empire slaves, Keshi Yena is a large round ball of cheese stuffed with spiced beef meat that is served baked or steamed. Included in the Keshi Yena stuffing is also chicken or goat meat. The national dish of The Bahamas is crack conch with peas and rice. As part of the national dish, cracked conch, a shellfish is often cooked in batter and service with rice and peas. This is often accompanied by potato salad, macaroni and cheese, and plantains. 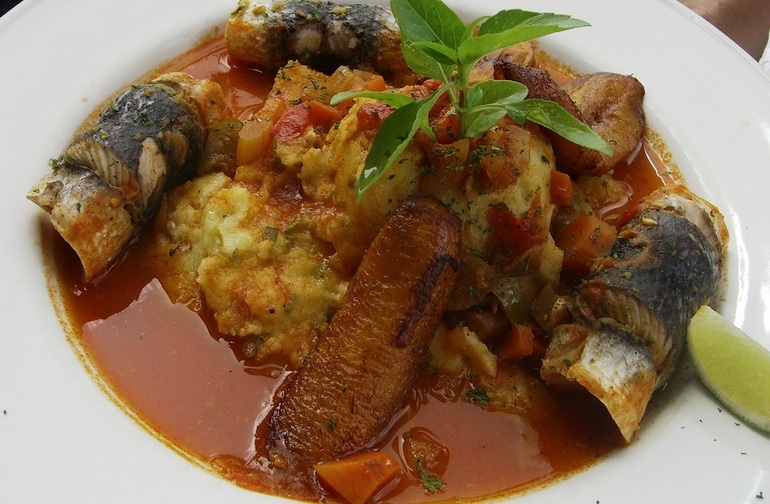 The national dish of Barbados is Cou-Cou and Flying Fish. Cou-Cou pronounced coo-coo is made with cornmeal, flour, and okra and is served with vegetables, ground provisions or rice. Flying Fish which is found in abundance around Barbados is added on the side either steamed or fried. Flying Fish with Cou Cou and Plantain. Photo: © Flickr/Lisa. The national dish of Belize is rice and beans with fish stew. The beans and rice are cooked together with various spices and coconut milk. The national dish of The British Virgin Islands is fungi and fish. Fungi Pronounced foon-gee, fungi consists of cornmeal that has been boiled and cooked to a thick consistency along with okra. This is served with steamed fish. The national dish of The Cayman Islands is turtle meat. Note that turtles eaten in the Cayman Islands are not from the wild but a government-owned turtle farm which is also a tourist attraction. The meat from these farm turtles are using in soup or braised as steaks and burgers. Similar to Aruba another Dutch Caribbean island, the national dish of Curacao is Keshi Yena. Meaning stuffed cheese, Keshi Yena is traditionally made with beef, goat or chicken meat along with vegetables, seasonings, and raisins. The national dish of Cuba is Ropa Vieja made with a mixture of shredded beef steak cooked with a tomato base infused with herbs which is often served on a bed of yellow rice with black beans and fried plantain. The national dish of Dominica was mountain chicken. However, as mountain chicken are now an endangered frog species, callaloo soup has become the national dish of Dominica. Callaloo soup is a combination of leafy vegetables such as spinach or dasheen mixed in with seasonings, provisions, meat and coconut milk. The national dish of the Dominican Republic is sancocho. Pronounced san-co-cho, this soup contains vegetable or ground provisions such as yams, yucca, and potatoes with a variety of meats most often beef, chicken, or pork. The national dish of Grenada is oil down. This bit of island goodness is made with ground provisions, including breadfruit and served with pigtail, salt beef or your choice of meat. The national dish of Guadeloupe is Porc Columbo which is pork seasoned with herbs and spices such as allspice, cinnamon, thyme, and curry powder. The seasoned pork is stewed with green pepper, chopped onion, garlic, sweet potato, diced tomato, and spicy seasoning peppers. The national dish of Guyana is pepperpot. This spicy dish differs considerably from Antigua’s version of the meal with the same name. Guyana’s pepperpot is made with casreep (cassava extract) and beef or choice of meat, it is served with white rice or black eye or split peas. That national dish of Haiti is griots with rice and beans. Griots are made by boiling and then frying cubes of pork. Griots are served as the main entrée, it is complimented with rice and peas. The national dish of Jamaica is ackee and saltfish. Ackee is a pear-sized fruit that when prepared resembles scrambled eggs. The saltfish is boiled to extract most of the saltiness, then fried up with green peppers, and onions. This dish is served mainly as a breakfast meal and with some breadfruit on the side, it can go a very long way. Jamaica National Dish: Ackee & Saltfish with avocado, plantains, etc. Photo Credit: © Jamaica Tourism Board. The national dish of Martinique is grilled snapper with creole sauce. Made with chiva, onions, parsley, tomatoes, peppers and other spices alongside grilled snapper this dish is a local favorite. It should also be noted, that some other locals believe that Marinated Codfish and Green Bananas is the favored national dish. The national dish of Montserrat is goat water. This thick stew made with fresh goat meat is served most often with rolls or white rice. Goat water is stable at family celebrations, social functions and in local shops, the rich stew with spices is a hearty meal. The national dish of Puerto Rico is Arroz con Gandulez and Pernil. Flaky rice with pigeon peas and pork shoulder. The national dish of Saint Kitts & Nevis is stewed saltfish with dumplings accompanied by spicy plantains and breadfruit. Hearty flavors come together in this meal with stewed saltfish, and coconut dumplings served alongside spicy ripe plantains, seasoned breadfruit, boiled in chicken broth. The national dish of Saint Lucia is green figs and saltfish. Green figs also known as green bananas are boiled or stewed and served with salt fish. This is prepared most often as a breakfast meal. The national dish of St Maarten is conch and dumplings. The conch is pounded and then pressure cooked with seasonings. The dumplings are prepared with flour, and with or without cornmeal. The thick sauce from the conch and dumplings is used as gravy. Conch and dumplings are a favorite year round but especially during carnival season when you will be able to get this hot and spicy dish all around the festival village. The national dish of Saint Martin is callaloo soup, a thick green soup made from greens with pork cubes, hot pepper, okra, black pepper, thyme, and chicken stock. The national dish of Saint Vincent & The Grenadines is roasted breadfruit and fried jackfish. Breadfruit eaten all across the Caribbean region is roasted on firewood and then baked in an oven until soft. Accompanying the breadfruit and fried jackfish is local golden apple juice. The national dish of Suriname is pom a casserole made with local root vegetables such as taro roots and meat. Pom is traditionally prepared on Sundays and for festive occasions such as birthdays. The national dish of Trinidad & Tobago is calaloo which is prepared in a blended style that almost resembles the Antiguan pepperpot. The dark green soupy concoction is well seasoned and is a staple of Trinis everywhere. The national dish of the Turks & Caicos is cracked conch. Conch is pounded with a meat tenderizer. Next, the meat is seasoned, then coated in flour batter and deep-fried until golden brown. NOTE: Originally published in 2014, this post was updated in 2018. Also, I’ve included the national dishes of all countries historically aligned with the Caribbean as the region is more than just geography. That said, how many of these Caribbean national dishes have you tried? All delicious, they are part of each Caribbean country’s national identity and self-image making for an authentic foodie experience.